2. )How is it constructed? Is it fully welded, silicone and pop riveted? 3.) Does it ship fully assembled? 4.) What is the warranty period and what is covered under the warranty? 5.) A good salesperson will not only know his products, but competitor’s products as well so ask “what makes your tub better than anyone else’s on the market? If you’re considering a large purchase it’s always a good idea to try to get to a tradeshow where multiple vendors with hydraulic tubs will be showcasing their products. A demonstration of the tub and seeing the workmanship up close is really important. No matter what we’re designing, we always consider the end user and how operating our equipment day to day will affect their longevity in this very physical industry. One of our smart clients lowers the tub, loads their larger dogs and when it’s time to go from the tub to the grooming table, they roll their grooming table over to the tub, lock the wheels and load the dog directly onto the grooming table. 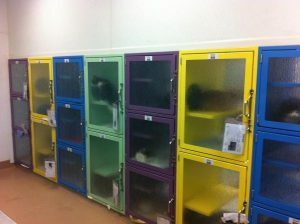 We are experts in kennel design and manufacturing, committed to quality control and testing. We actively seek out and test the best materials that will promote durability and longevity with the added benefit of being the best looking dog kennels on the market. We understand after more than 25 years of manufacturing that the construction of our dog kennels is just as important as they type of materials we use. Whether you are a luxury boarding facility, animal shelter, rescue, control or a busy veterinarian we look forward to the opportunity to share our knowledge as a kennel manufacturer with you.